Taking up the issue of farmers, Rajya Sabha MP Naresh Gujral said today that the farmers were being squeezed in the government move of curbing inflation, while rich industrialists, who formed cartels, were going scot-free. The Lok Sabha today had some “sporting moments” during the zero hour, with Gurudas Dasgupta of the CPI (M) batting against the Twenty20 format of cricket. The CBI filed an interim chargesheet in the multi-crore kidney scam against nine persons, including the alleged kingpin, Amit Kumar, in the special CBI court here today. The Indian Olympic Association (IOA) was able to take the extreme step of removing the all-powerful head of the Indian Hockey Federation (IHF) K.P.S. Gill yesterday only after it received a green signal from the government. Clueless about south India, BJP president Rajnath Singh said here today that his party would align with any disciplined party in Tamil Nadu for the next general elections. MV Rezzak, the ship bound from Russia to Turkey that went missing a while ago, today drew attention of the Lok Sabha with several members urging the government to save the lives of Indians aboard. They said Interpol’s help should be sought if needed. The police today booked Arun Gawli, gangster-turned politician, under the stringent Maharashtra Control of Organised Crime Act. Gawli, a member of the state Legislative Assembly and president of the Akhil Bhartiya Sena, had earlier been arrested for his involvement in an extortion case. Leader of the Opposition L.K. Advani today asked Prime Minister Manmohan Singh to make a statement on controversy related to minister for road and shipping T.R. Baalu and questioned UPA chairperson Sonia Gandhi’s silence over the issue. The CBI’s submission before the Supreme Court that controversial Congress MP from Assam Mani Kumar Subba’s birth certificates and several other documents submitted to the Election Commission appeared to be fake, has come as a major embarrassment for the Assam Pradesh Congress Committee that has started preparation for the next round of general election. The fast-growing aviation industry in India faces a shortage of pilots and an estimated 6,000 more certified captains will be needed in the next five years. Union law and justice minister H.R. Bhardwaj today moved a Bill in the Lok Sabha to increase the number of Supreme Court judges from 25 to 30, excluding the Chief Justice of India. The Parliament today approved by a voice vote the extension of President’s Rule for another six months in Karnataka, where the Assembly elections are due next month. To hear the complaints of the disabled, the chief commissioner for persons with disabilities will hold a mobile court here tomorrow, making Uttar Pradesh the 17th state in the country to hold such court. The Mayawati government disbanded the Vijay Shankar Mathur Commission inquiring into the irregularities in the allotment of land and construction in Noida and Greater Noida. The decision was taken today during a state cabinet meeting presided over by the Chief Minister. Fare of a rickshaw ride soon turned into a skirmish between Shias and Sunnis in the Husainabad area of the old city last night leaving several injured. Though the situation was under control by this morning, palpable tension was visible with heavy PAC and RAF deployment in the area. Many preventive arrests have also been made. After spending 53 days behind bars, arms dealer Suresh Nanda and his son were today granted bail by the Delhi High Court in a case of allegedly tampering with evidence related to kickbacks received in the Barak missile deal. Cement and steel prices had increased by over 100 per cent in a short span of time, yet the government had taken no action against large companies except making statements and issuing vague threats, he alleged. Gujral, who is a SAD member from Punjab in the Rajya Sabha, was speaking during zero hour here this morning. Wheat procurement was done by creating hurdles for farmers and denying them the right to sell their produce to private players. He demanded an MSP in line with the international prices. Gujral said the country was witnessing a bumper harvest, but there was a global scarcity of food grains largely because of short supply from traditional suppliers like Australia and the US. As a result, international prices had gone up exponentially. Naturally, the Indian farmer wished to reap some benefit and get the best price for his produce. However, in order to restrict the entry of traders and corporate houses, who would be ready to offer higher prices to the farmer, the government was creating artificial hurdles in their way. Private players had been warned to stay away from the mandis of Punjab and Haryana, said Gujral. Farmers were forced to sell their produce to the state agencies like the FCI, which had procured 99 per cent to 99.2 per cent of the wheat arrivals in the mandis this year as against 78 per cent last year. Another setback was the decision taken by the Union government to withdraw incentives on the export of skimmed milk, ghee and other milk products. The government had extended the incentive scheme by a year on April 11 and had unfortunately decided to withdraw it barely within a week of its announcement with the objective of bringing down the domestic prices of the items. Punjab had been performing extremely well in the field of export of value added milk products, especially ghee. It had exported nearly 800 tonnes of ghee apart from other milk products and was getting an incentive of Rs 7 per kg on ghee. Similarly, other milk products were being given export incentives in order to make them competitive internationally. The cooperatives, which were exporting these products, were passing on the bulk of the incentives received to the farmers by way of better prices, Gujral argued. The Deputy Speaker of the Lok Sabha, Charanjit Singh Atwal, who is an MP from Punjab, today took up the issue of speeding up wheat procurement and meeting the shortage of gunny bags. Atwal called on the chairman of the Food Corporation of India, Alok Sinha and told him about specific areas from where lifting was slowing down due to the shortage of gunny bags. The Deputy Speaker asked the FCI chairman to focus on the issue and sort it out. Sinha assured prompt action. Terming the latest IPL matches as “tabloid version of cricket” and fertile ground for open gambling and betting, Dasgupta demanded the government to trace sources of the massive fund flow on the entire event. He said a sum of Rs 4,000 crore was being spent on IPL, referring to BCCI chief Sharad Pawar’s earlier aversion to Twenty20 version. “Now even Pawar has retracted from his earlier stand,” Dasgupta said, as Pawar listened. That apart, the matter found support from across the House and might come up for separate discussion during the session. Dasgupta, for his part, blamed the mess on the USA. “But the USA has no cricketing history worth any name,” wondered several members, causing Dasgupta to alter his statement a little: “It’s because of the US, the UK and Australia. We are falling victims to consumerism and tabloid cricket. Teams are being franchised; players are being bought. Now industrial houses and airline magnates are owning teams,” Dasgupta rued, asking the government if the game should be allowed to lose its original character and whether open betting and gambling should be allowed in its name. Apart from Kumar, Saraj Kumar, Upender, Jeevan Raut, K.K. Aggarwal, Jagdish, Gayasudeen, Linda and Manoj have been charge sheeted in the case. The main chargesheet will be filed by next month. The chargesheet was filed under Section 22 of the Transplantation of Human Organs Act as the kidneys of a number of persons were transplanted to others without adopting proper legal formalities. The arguments on the chargesheet will be conducted on May 9. Pooja’s name, who is the wife of Dr Jeevan, was not included in the interim chargesheet. The court has already granted interim bail to Pooja for a specific period. According to information, the CBI in its 50-page chargesheet had indicated the details of some donors and recipients of kidneys. It also briefed how poor persons were allured by some of the accused to donate their kidneys for the transplantation purpose. The CBI also gave the details of some doctors who were involved in the scam. No exact details of influential persons, who were beneficiaries, were mentioned in the chargesheet, sources said. CBI prosecutor A.K. Singh, who submitted the chargesheet in the court, later said the CBI had investigated the matter in detail and an interim chargesheet had been filed. The CBI had arrested Dr Amit Kumar on January 24 from Nepal for his alleged involvement in the international kidney racket. Later, his brother Dr Jeevan and other around one dozen persons were arrested in this regard. Except Pooja, none of the accused had been granted bail so far. All accused were in judicial custody at present. The Gujarat and Maharashtra police had taken Dr Jeevan and Dr Amit in its custody for the investigation in two other kidney cases, which were registered against them a few years ago. The bail applications of Upender, Gayasudeen, Jagdish and Dr Saraj were also filed in the court today. Pooja, who was granted interim bail, was directed to appear in the court on May 7. Although there have been innumerable demands for K.P.S Gill’s removal over the past several years, the IOA was helpless in acting on them because of the backing he enjoyed in official circles and from other sports bodies. 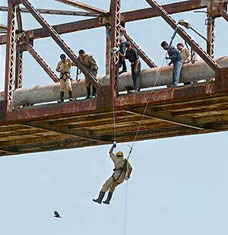 UPA sources admitted that the authorities had been slack in taking note of the allegations levelled against K.P.S. Gill during his 15-year tenure as IHF chief even though the sports body is funded by the government. “Given Gill’s clout, it was impossible to remove him...successive sports ministers had failed in this mission,” remarked a senior Congress leader, adding that heads of other sports bodies had also joined hands to protect him as any action against Gill would have rendered them equally vulnerable. However, neither the government or the IOA could afford to brush this issue under the carpet as there was widespread public outrage when the Indian hockey team failed to qualify for the Olympics for the first time in history. To make the matters worse, the IHF was recently rocked by a scandal when an expose revealed IHF secretary-general K.Jothikumaran allegedly accepting a bribe to select a player for the national team. This had turned the spotlight on Gill’s management of the IHF and demands for his ouster were getting louder by the day. The first indication of the government’s stand vis-a-vis K.P.S.Gill came a day after the bribe scandal surfaced when the new sports minister M.S.Gill publicly asked the IHF chief to step down in order to restore faith in the hockey establishment. “I have agonised long over the IHF. The recent disaster in Chile where the hockey team failed to qualify for the Olympics is still fresh in every Indian’s mind. Now, trust and faith in fair selection is shaken. I believe, in the totality of the situation, the IHF President must also introspect and review his position,” the minister had said in a statement. This had prompted K.P.S.Gill to retort that the sports minister knew nothing about sports. Eventually, the decision to sack Gill and suspend the IHF was taken unanimously at an emergency meeting of the IOA yesterday. K.P.S.Gill was present at the meeting but chose not to say anything in his defence although he was given an opportunity to place his views on record. He also declined an offer to say anything to the Press when IOA president Suresh Kalmadi announced the decision at a packed press conference on Monday evening. Unlike Atal Bihari Vajpayee or L.K. Advani, who need not be introduced in South India, Rajnath Singh proved to be a greenhorn as he even said the BJP would like to have an alliance with the AIADMK within the NDA alliance for the next general elections, bereft of the knowledge that the AIADMK no more existed within the NDA. He did not even know the fact that in Tamil Nadu regional parties call the shots and that he needed to woo AIADMK supremo Jayaram Jayalalithaa for forging a pact. He came here to participate in the valedictory function of Lotus Yatra undertaken by the state leaders of the party. Rajnath Singh was more eager to talk about price rise and said, the UPA government should come out with a white paper on inflation. ‘The UPA government should bear the full responsibility for the present food crisis and inflation in the country. The present government had failed to take any constructive steps in controlling inflation,” he said. He said the union finance minister should clarify from where he adjusted funds in the budget to waive the amount of Rs 60,000 crore. Raising the matter during the zero hour, Anant Geete, senior member of the Shiv Sena, said he feared that the ship had either been deliberately drowned to claim hefty insurance amounts or hijacked. He cited a similar tragedy that occurred nine years ago. Years later, MV Rezzak had gone missing after it was 90 miles into the journey. The ship was untraceable since April 17. “The ship was 25-year-old and had 38 faults. One does not know why it was allowed to go into the seas in the first place. The insurance firm for the ship is located in London and the company that provided them with Indian workforce is not registered in India. Everything is dubious,” Geete said, raising alarm and asking the government to get the home ministry, the external affairs ministry and the surface transport ministry to work together for locating 25 Indians, who were on board the ship. “They might be alive, and we must save them,” Geete said. The families of missing Indians had also written to the surface transport ministry for help. The police today booked Arun Gawli, gangster-turned politician, under the stringent Maharashtra Control of Organised Crime Act (MCOCA). Gawli, a member of the state Legislative Assembly and president of the Akhil Bhartiya Sena, had earlier been arrested for his involvement in an extortion case. Gawli was presented in the Sessions court, which has remanded him to police custody till May 14, joint commissioner of police (crime) Rakesh Maria said this afternoon. “Gawli, after being found guilty in an extortion case, was arrested. Then police officials gathered evidences against him and prepared a watertight case against the former don,” he said. 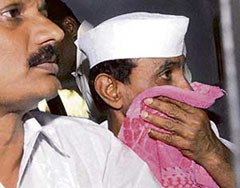 Before Gawli’s arrest, his brother Vijay Ahire was arrested by the Mumbai police for his role in the extortion case along with his associates, after which Gawli was arrested for his role in the crime. “We have evidence against Gawli of his involvement in the crime. He chalked out the plan and received a big part of the extortion money,” Maria said. Earlier, when Gawli was arrested, the police had recovered more than 300 property documents from his residence. At the BJP parliamentary party meeting here today, Advani accused Manmohan Singh of not discharging the duty of a Prime Minister by not making a statement on the DMK minister, who himself had admitted to his role in seeking favours from the ministry of petroleum and natural gas for companies owned by his sons. Stating that the PM was presiding over the most corrupt government in the country’s history, Advani said the silence of both PM and the UPA chairperson showed how much the Congress and governments headed by it had departed from the standards of probity and accountability that prevailed in the early decades of Independence. The three-member apex court Bench headed by Chief Justice K.G. Balakrishnan yesterday gave the controversial MP from Assam three week’s time to prepare his defence against what the CBI had submitted before the court. Chief Minister Tarun Gogoi today told the media here that the party and the government wouldn’t react to the issue since it was under the consideration of the Supreme Court and the CBI. At present, the booming airline industry is facing a shortage of approximately 1,000 qualified pilots, union civil aviation minister Praful Patel told Rajya Sabha in a written reply today. With the present growth of the aviation industry, it has been estimated that in the next five years, 5,000 additional pilots would be required for scheduled operations and 1,000 pilots for non-scheduled and private operations, he said. Patel said the government had taken various steps, including increasing the retirement age of pilots to 65 years and setting up of a training institute in Maharashtra to reduce the demand-supply gap. Other steps included upgrading and modernising infrastructure at the Indira Gandhi Rashtriya Udaan Akademi to enhance its training capacity from 40 to 100 pilots and reduce the training period. To another question, Patel said the government had approved the civil aviation requirements prepared by the DGCA for carriage of physically challenged persons in flights in consultation with the AAI, federation of Indian Airlines and NGO’s. The Supreme Court (number of judges) Amendment Bill, 2008, seeks to ease the backlog of cases in the Apex Court and speedy trial. Bhardwaj informed the House that the Chief Justice of India (CJI) had intimated that the judges of the apex court were overburdened and had been working under tremendous pressure. Besides, it was not possible for the CJI to constitute a five-judge Bench on a regular basis to hear cases, involving interpretation of constitutional law. As it would result in constitution of less number of Division Benches, which in turn led to delay in the hearing of other civil and criminal matters. The extension became necessary as the current term of the President’s Rule will expire on May 19, but the election process would be completed only by May 28. The Statutory Motion was placed in both the Houses by Home Minister Shivraj Patil. While moving the motion for approval in the Lok Sabha, Patil said President’s Rule had been imposed in the state in November 2007 as no party or coalition of parties were in a position to form the government. Speaking to the press on the eve of the mobile court, deputy chief commissioner for persons with disabilities T.D. Dhariyal said mobile courts introduced in November 2006 entertained all type of complaints attached with proof of evidence. During the past, 16 mobile courts held in 11 states, 4,751 cases were registered and with the effort of the state governments 4,440 cases were solved on the spot. The mobile courts helped persons with disabilities in rural and remote areas to access the redress mechanism. Such courts also raised general awareness and sensitivity amongst the civil society, said Dhariyal. According to the state government, the decision had to be taken following retired IPS officer Mathur’s refusal to submit a preliminary inquiry report despite innumerable extensions. In may be recalled that on 25 January 2004, the then Mulayam Singh Yadav government had set up the Mathur commission to look into complaints of irregularities in the allotment and construction work in Noida, Greater Noida. Incidentally, the commission was to submit its report within three months. However, despite numerous extensions in the past three years, the commission has not completed its work yet leave alone submit its report. Haggling over the rickshaw fare took seconds to turn into a scuffle followed by stone pelting between groups of Shia and Sunni Muslims in the Husainabad Gate area having a history of Shia-Sunni violence. At least six persons were injured in the clash. Senior police and administration officials are camping in the area and the PAC and RAF took out a flag march in the narrow bylanes of the old city areas late at night.